Gensler partnered with Bristol-Myers Squibb to design a new corporate campus located in New Jersey at Princeton Pike. The 650,000 square-foot building houses over 1,000 employees and promotes collaboration, fosters teamwork and supports health and wellness. How? We’re talking open-office design, break-out spaces, a crazy cool cafeteria, fitness center (with towel service! ), touch screens, an IT service bar and of course, Starbucks. The real crown jewel of the campus is the atrium and that’s where the GOATS come in (we are the greatest of all time when it comes to custom lighting in case you didn’t know). The space is shaped like an intersection of city streets and brings the employees together. The uber-large volume needed an art installation that was inspiring, energizing, engaging and all around awesome. When Bristol-Myers Squibb & Gensler ask…we deliver. Gensler incorporated ultra-bright tones and used these to color code each level. We wanted to expand on the idea of color while incorporating the Bristol-Myers Squibb logo in the design. Starting at the top, we created an aluminum structure in the shape of the glyph logo. This is the backbone of the sculpture (and of the company!) and holds all of the pieces together. We felt it was most meaningful to incorporate the symbol here. 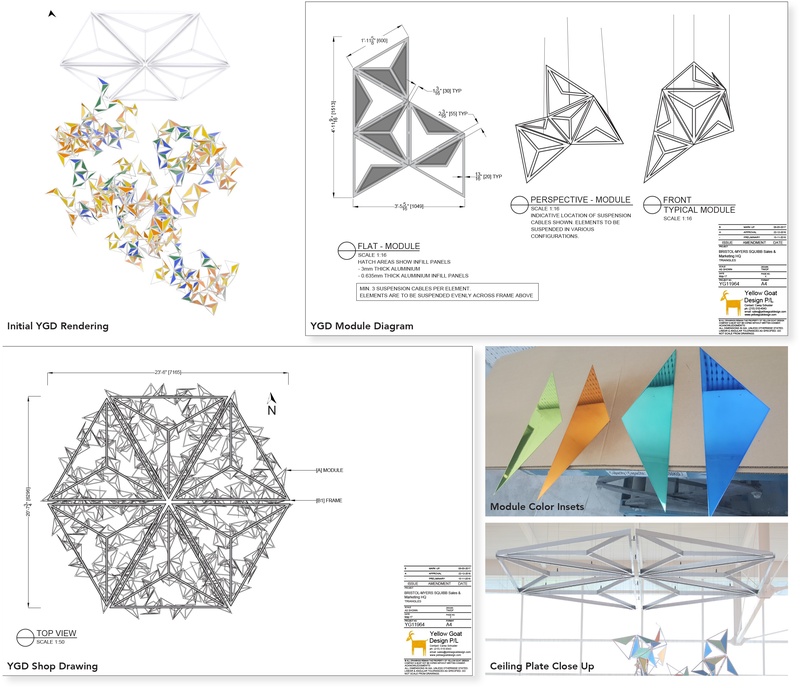 Suspended from the glyph structure are over 72 different module sets that represent the company's journey and mission. Each module includes varying colors, shapes and arrangements that showcase the diverse, global work of Bristol-Myers Squibb and their goal to give back and provide a more vibrant, hopeful and healthy world. The sculpture measures an impressive 23’-6” x 20’-7” and spans nearly 32’-8” in height. 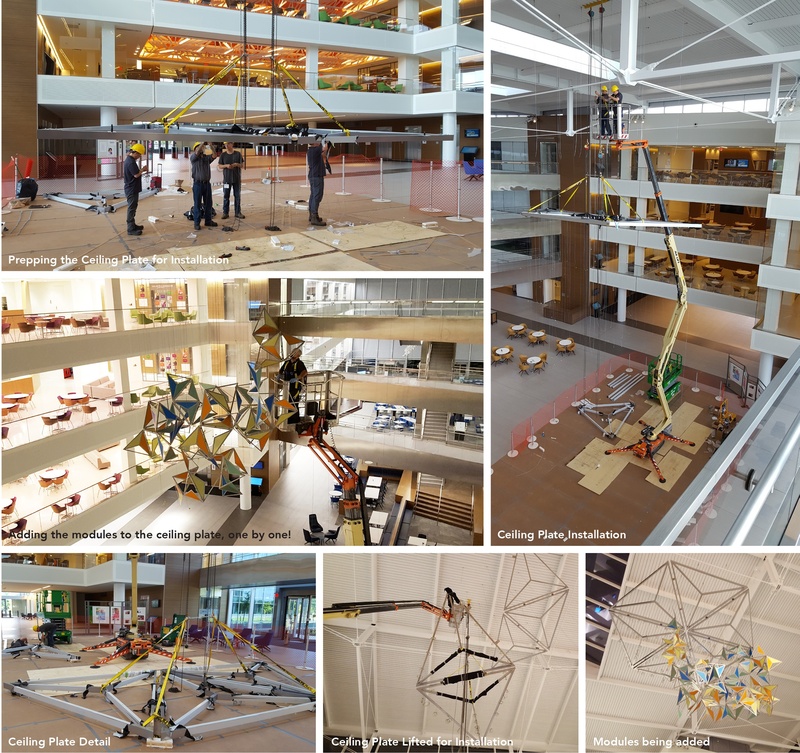 YGD’s team not only designed and fabricated the piece but also installed it on-site for a seamless process from beginning to end. Jack of all trades at the GOAT! We were thrilled and honored to be included in such a meaningful, transformative project. 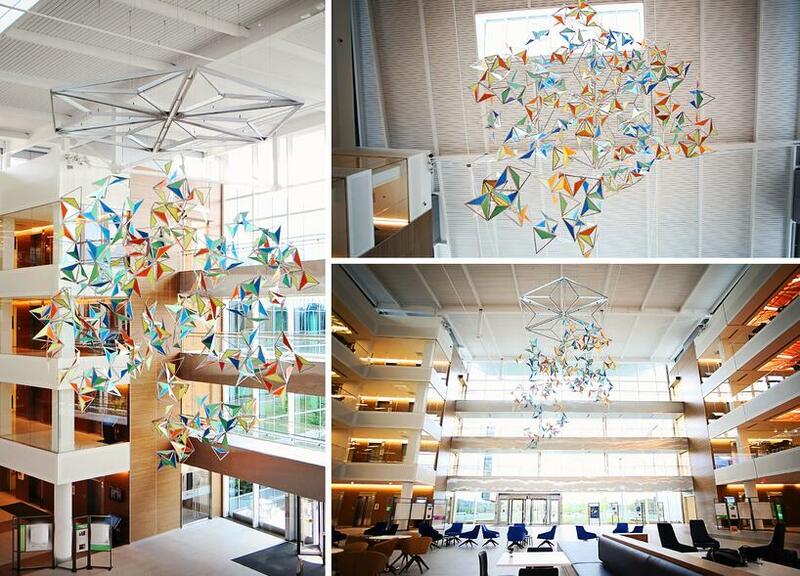 This sculpture not only represents the aspiring work of Bristol-Myers Squibb but also the success stories of their patients worldwide. A heartfelt thank you for the inspiring work that truly makes a difference to the patients they help and the people they employ.